Decades later, after a northern Illinois middle-school class read Is It Night or Day?, a historical novel that captures the two girls’ friendship, the students were so moved by the story that they made it a class project to reunite the two women. Fulfilling a shared life-long dream, the two women, now in their 80s, finally saw each other again in Seattle, Washington, in 2011. 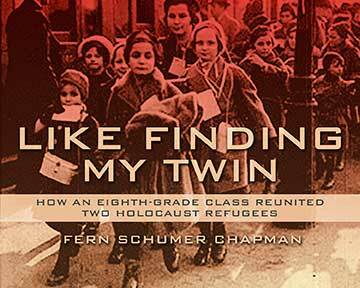 Like Finding My Twin captures the friendship of the two Holocaust refugees, the students’ research, and the remarkable reunion 73 years after Gerda and Edith shared their immigration journey. Download a free eSource reading guide for educators for this title. Published by Gussie Rose Press and distributed by Kar-Ben Publishing; learn more at www.fernschumerchapman.com. eSource guides are tools for educators--parents or teachers--for helping children understand selected Kar-Ben books. These guides include historical context, definitions, pre- and post- reading questions, plus ideas for projects and activities. Download an eSource for Like Finding My Twin.